Terry Chapman attended Peter Galbert’s Windsor Chair class last year, and he had a ball. Today we are taking a look back at the writing he did for our blog that week, in anticipation of the new week-long class that Peter is offering at Highland this year starting October 31st. 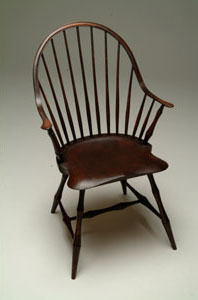 This year’s class features a beauty of a chair – the continuous arm windsor, an icon of American furniture. If you’ve ever wanted to build yourself an heirloom piece of furniture that you can pass down to your children or grandchildren, Peter’s class is a great way to make this happen. And if you want an insider’s perspective on what the class is like, click below to take a look through Terry Chapman’s posts from last year – you won’t be disappointed, but you will be entertained. Ready to sign up to make your own piece of heirloom furniture? Click here to find out more about the Continuous Arm Windsor Chair class being offered this fall at Highland Woodworking by Peter Galbert.